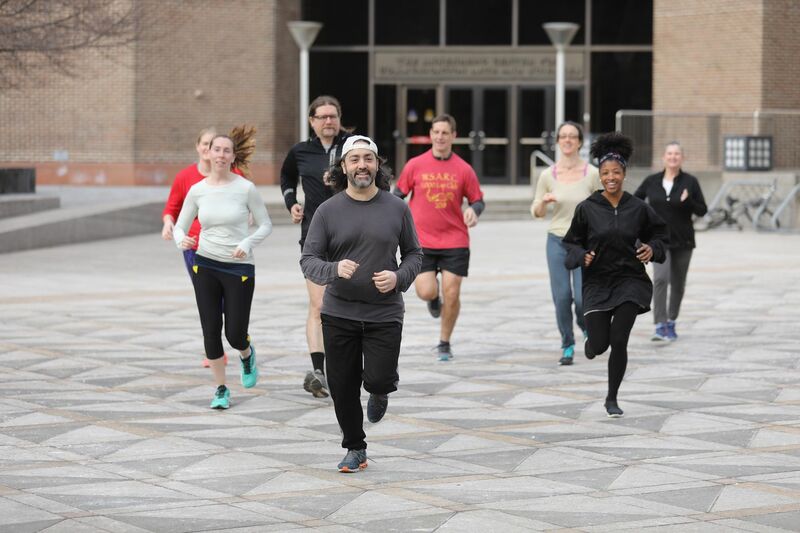 Mario Giorno (middle) and other members of the Annenberg (Lunchtime) Running Club meet three times a week at the plaza at 36th Street and Locust Walk in University City. A theft suspect who made a run for it after allegedly swiping a laptop computer and cell phone from a University of Pennsylvania building last month ran straight into a running club during his getaway and was promptly chased down by the fleet-footed group. The running group began three years ago and is open to anyone who lives or works in West Philadelphia. On Jan. 9, Cassidy and three other members of the group were gathered shortly before noon at the plaza at 36th Street and Locust Walk, waiting for any stragglers to arrive, when somebody sprinted through them. Kyle Cassidy (middle in black) and other members of The Annenberg (Lunchtime) Running Club. Once the running club realized what was happening, the members sprinted off after the suspect. It only took them about 30 seconds to catch up, Cassidy said. The chase took them through an active construction site at 37th and Chestnut Streets. Two of the runners, Samantha Oliver and Natalie Herbert, surmised that if they were being chased they’d hide the stolen goods in the backyard of a nearby home. The runners knocked on the door of that home and when the owner answered, the suspect allegedly sprinted from a bush in the backyard right into the two officers, according to Cassidy and police. Adams, of the 300 block of Fountain Street, was taken into custody and charged with burglary, criminal trespass, theft, and receiving stolen property, police said. The laptop and cellphone were recovered in the backyard. Adams’ attorney did not immediately return a request for comment. Court records indicate Adams posted bail in this case but is incarcerated in the Delaware County prison on unknown charges.